New feature on European/Australian and Japanese DSi systems. Now you can upload your photos to Facebook without an SD card! If you've got a European, Australian or Japanese DSi, you can now go to the settings menu or the DSi Shop to be presented with a system update - Once you've done this, the photo album will get a new feature. After taking a picture, there will be a new button when looking at it in your photo album. Marked with a white f in a blue square, it's quite obvious what this does - It lets you send your picture directly to Facebook, that is, if you've got a Facebook account! The first time you try this feature you'll be asked to enter your Facebook login e-mail and password, but after that you're free to upload as many pictures as you want. Once you've uploaded a picture, a new photo album will be created on your Facebook account, titled "Photos from Nintendo DSi," which will have every picture you upload in the future. Simple and quick to use! We assume this update was released in Europe/Australia today to coincide with tonight's Wii/DSi updates, so we don't expect North American DSis to get this update until Monday. But you never know! What's the point? A slightly better opera browser and a Facebook app thing I'll never use? @Hardy83: Always so harsh with the DSi . I know tonnes of people who'll use this function, I probably won't because I'm lazy, but if I see something crazy enough, at least I know it's there. And for those who are curious it apparently takes 3 extra blocks from your DSi memory to perform this update. Once again, North American users are forced to wait. How interesting. Nice update... now give me a twitter client Nintendo! The Dsi browser needs to be updated it just feels to slow and clunky to be useful. Glad I did not have to play Wii points for it. The Facebook app will be nice since you can do some cool tricks with your photos and then post them. Tony the DSi Browser has been updated in Japan and Europe and Australia. What does the Browser update actually do...? Nice little update. Interesting that NA is last to get it, since Facebook is an American/English website, or at leaststarted as such. I do not use Facebook, so this an useless update to me. Facebook even more evil than Twitter. What about a myspace app, or better yeat, YOUTUBE! Awesome, now all I have to wait for lazy NOA to update us here in the states! Don't really use my DSi for photos (I use it for games, how novel), but this is definitely a good update for those who do use the camera's a lot. I feel like all of this stuff should be pretty much standard at this point. I am sort of interested in the browser update. Hopefully it will scroll pages a little more fluidly like the iphone does. Apparently the Browser update increases the speed of image loading on web pages. It's 2 or 3 blocks smaller, too. A Facebook app is cool, I guess. Too bad I barely use mine. Is there anything else in the system update?? Photos and thumbnails in the album open way faster. The DSi also plays NES, SNES, Master System, Mega Drive, C64 and TG16 games from VC now, too. You transfer them from your Club Nintendo account onto your SD Card via your PC. Not really, but that would work pretty well. This update is reportedly blocking all flashcarts that were previously compatible with the DSi. That's the best news I've heard in a while. This means that all those (mostly Asian) retailers that are selling these devices in great numbers will have their entire stocks suddenly made useless, because they can't exactly sell them to customers with a note saying that you'll have to have a DSi on old firmware, never access the Shop Channel, etc. The more Nintendo keeps doing this, the harder it will be for flashcart manufacturers to stay in business, because in one instant they can have their entire lot negated, and their retailers angry about a suddenly useless product. They may find another exploit and create new flashcarts, but the point is that these flashcart manufacturers have now effectively had all of their current stock invalidated, as well as everything they've shipped out to retailers. This means that the companies are taking a huge hit, the retailers will not be happy with the situation and may not purchase future cards in bulk, and the whole enterprise becomes much more uncertain financially. All in all it's a good move. I actually follow DSi homebrew progress very closely, and I look forward to Twiizers finding a way to run DSi-mode homebrew in the near future, but the companies that are mass producing flashcarts for piracy are another matter entirely. They're easily the biggest threat period to the success of retail DS / DSi games, and anything that helps shut them down or damage their profits is a good move. I most certainly agree with your desire to see piracy fail, but some of these flashcards have updatable kernels or something to that effect, which makes a kernel update the only thing needed to unblock them. Some of these carts have various update capabilities, but most currently do not, and even with those that do, it's still highly uncertain at this point whether or not they'll be able to get around the new block without a real hardware change. We'll have to wait and see. Either way, however, this is no small problem for the companies involved, even if a few of them manage to beat the update after a while. Again, some may be able to get around this by some sort of firmware update, but it's not entirely clear just yet. I'm betting that at least a very significant portion of those that supposedly are update-able will not be able to beat this one without releasing new hardware. DSi is looking slightly better to me, but still not sold. I'm keepin my Lite for quite some time, until I see something really great. Every once in awhile Americans don't get what you get either so it's a bit more than a matter of patience. Like warioswoods said, these carts can update the core internal loader, which may make them compatible. But at this point, it's still not safe to update (duh). This is why I'm not buying a DSi until we get DSi mode flash carts. Facebook is a solid start, especially considering their new audience. However, I like many others wish they would up their ambition a bit. They treat Wii/DS/DSi as if they have a completely different set if fans and that's not entirely true. Up the Wii/DS connectivity Nintendo. Give us more personalization for both. Both your old and new audience would appreciate it. Quality and quantity. Either way, I do not have a FaceBook account, but a blog (and DeviantArt), so this is not for me, anyways. I think that is stupid that NA hasn't got this update yet. Usually we get stuff before Europe and Australia. I'm not at all suprised Japan has it, in fact i'm more surprised Japan Didn't get it like a month ago. Anyway, Monday would be nice. I hope we get this update soon. I have some pictures I wanted to upload for the forum thread about stuffed animals, but it's too much of a pain to copy with SD, so I haven't bothered, especially since I knew this update was supposed to be coming eventually anyway. meh... the facebook addon is not entirely without screwups. example: i cant upload anything...it gives me an error code that doesnt exist in nintendo support.It does say comunications error though...but i can go online (like now) /w no probs. in any case,this is a step in the right direction.Maybe its a begining or a test for them to realize how much online comunities r realy worth.Who knows,maybe by the next year we will have a youtube app or even an IM/webcam client.point being,it just shows u that maybe Ninty is not braindead entirely. But i do know i wont dl any new dsiware app till next year. It's much more than that. Those who already purchased a flashcard will have to choose between either keeping their card functional or updating, which involves more than just the Shop purchases -- they won't be able to get the new faster version of the web browser, the free Flipnote app everyone has been waiting for, or any further updates Nintendo gives us in the future. But the even bigger issue, as I've noted above, is that the companies that manufacture these cards are sure to take a huge hit as a result of the update. They've been mass producing these things, and now their entire lots are potentially useless, because no online retailer is going to want to sell something that won't work for anyone who bought their DSi after a certain date, or for anyone who ever wants to access the Shop, has already updated, etc. So, Nintendo is attacking the business and profit behind piracy devices very effectively. Oh for ****s sake! I DO NOT NEED FACEBOOK ON EVERY ****ING THING I OWN! I DO NOT NEED IT ON MY 360! 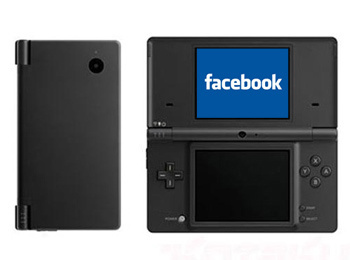 I DO NOT NEED IT ON MY DSi! Go **** yourself, Facebook. mjc0961: emm dude...u can just STOP using it ,okay? I think it is better to have something more or less? (okay okay,they shouldn't forget about other useful things.But Nintendo with its stupidity can be quite fascinating sometimes) I mean,it doesn't force you to use facebook ,man But maybe it would be better if the FB app would be a freeware thing from the DSiWARE store.U know,just an applet not a system-integrated thing. @RooF: hmmm ... dammit,i envy you all who can do this. I mean,what the hell is wrong with my FB applet? I am so frustrated... And there is 0 (as in ZERO,NADA,ZILCH) support for this problem. "A man who has no interest to the state,we don't consider him harmless, but useless"
"A citizen who does not participate in a states political life is useless" Because not all men were citizens of Athens and so not all men had the right to participate. 'K! I'll use this, but how about a full-on Facebook app like the iPhone/iPod touch one? Not to mention that I'm hoping for video recording support for the cameras. I'd like to think that a simple update to the camera/photos app could add this in. I'm fine with SD-only support for these videos. And how about using downloaded stuff that's on SD cards, a la Wii Menu 4.0? And a DSi VC would be awesome, too. Now, if only they could overhaul their software architecture to allow the DSi to multi-task (e.g. : play a game while running an app, say, the music player at the same time.). Okay; I'm having the same problem with the error code 369008; my son tries to upload a picture to facebook (newly created facebook account), it gets stuck in the "uploading photo" screen, then finally gives the error code. The album was created on his facebook page, but the picture just won't load onto it. Any suggestions?? @mlfanatic: SAME thing here... it is weird.I have a Facebook account for a few years though.Too bad i can't use the DSi to UL pictures. I mean, the Nintendo customer support won't reply to my questions and there is basicaly 0 tech. support for this problem. Mind Fever: ever solve your problem? We still can't get the pics up. A call (2, actually) to Nintendo's support line reveals that they have "never" encountered this error code or problem before. They have a techie calling me back in two days, but I'm not holding out much hope.... Anyone else have any suggestions? The album appears on the facebook page, but no picture ever uploads, and the error message on the dsi is still 369008.